This chapter addresses the origin of the alpha satellite repeat arrays comprising variable-size human centromeric chromosome regions. These repeats, which share a basic 171 bp monomeric unit, usually attach head-to-tail in extremely long arrays and have their own taxonomic nomenclature . The emergence and function of these highly repeated sequences in higher primates has been the subject of considerable investigation in the past two decades. By-products of these investigations include the recent development of human artificial chromosomes with and without alpha satellite repeats [16,54–56] and the characterization of centromere-associated proteins . 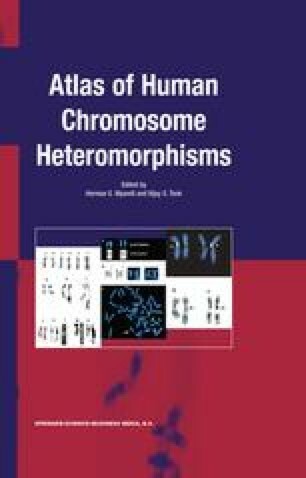 This chapter describes a method for identifying 12,039 of the most homologous alpha satellite sequences in the current human genome database using BLAST and a 470 bp cloned sequence reported to hybridize to all human centromeres . These data and three published sequences were used to identify the single most homologous sequence for each of 27 higher primate chromosomes. One highly homologous sequence was identified that is present in orangutan, gorilla, and chimpanzee. PAUP and Phylip computer analyses derived multiple similar parsimonious evolutionary trees based upon multiple algorithms that each included all 27 sequences. The PAUP-derived single heuristic evolutionary tree also defined a consensus sequence that represents the probable progenitor alpha satellite sequence common to all higher primate sequences analyzed. These results are consistent with initial dispersion of ancestral 171 bp repeat sequences to each human chromosome, followed by sequence divergence prior to and during duplication along with occasional inversion of larger numbers of tandem repeat sequences (higher order repeat; HOR). Our results are consistent with prior computer modeling results that suggested greater variability would be found near the euchromatic gene-carrying regions flanking the chromosome centromere, sites where ancestral sequences could be modified prior to generation of the current higher-order arrays. These higher-order arrays comprise the characterized centromeres that vary substantially, resulting in the microscopically visible size differences described in other chapters. These most homologous sequence repeats within the derived PAUP heuristic tree have been modified from the ancestral sequence by all the mechanisms that account for molecular and microscopic polymorphisms: inversion, insertion, deletion, translocation, base pair substitution, and duplication (by reciprocal translocation or concerted evolution).